Wikipedia says that The King of the Cats is an ancient British folk tale. Its earliest complete written form is dated to 1782, though Sir Walter Scott commented that it was a well-known nursery tale by then; and earlier allusions to it have been made in British literary works predating Shakespeare, with still earlier variants featuring elves found in Irish mythology. There have been many modern variants and new literary works inspired by it, including Barbara Sleigh’s 1955 Carbonel, the King of the Cats, which I reviewed here last November. 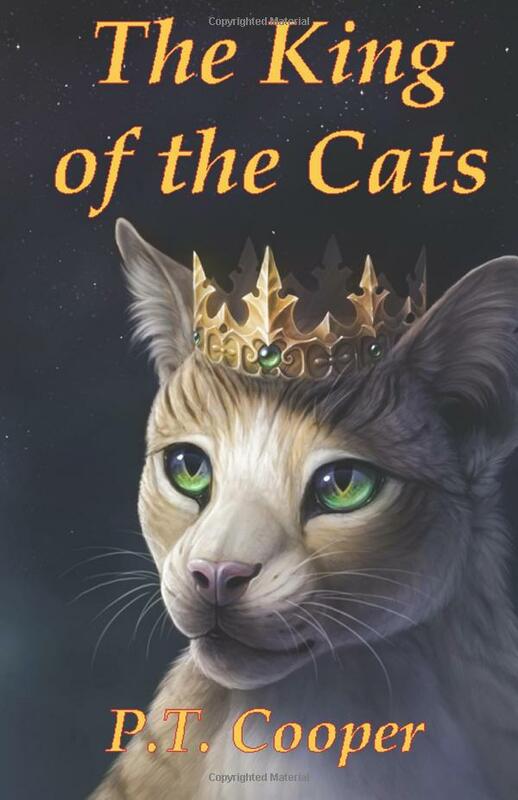 Now Perry T. Cooper has written a novel that expands upon the tale, and tells what happens to the new King of the Cats from the beginning of his reign. The old king was Thomas the Fifty-Sixth, well-beloved but so elderly that his death was expected by all in the cat kingdom. Those most concerned are his son Alexander and his chamberlain Ebon. Alexander is worried because King Thomas was recently overseen talking in human speech by a human scoundrel. That is the prologue. The story starts with Jack Tigerstripes, a brawny young tomcat lazing on a pier at a seaport on the east coast of England. Jack is mildly concerned about the death of the King of the Cats – King Thomas was well-loved; also, “The news was also a blow to the pride of every cat, for it meant that, for the moment at least, the cats of England had no king. For the moment, the cats were no different from the dogs or birds or mice. That realization was a bitter pill for any cat to swallow.” (pgs. 31-32) – but it does not really concern him. Then a cat escapes from a ship bringing an exotic cargo from the Orient to England; a strange blue-eyed, frightened Siamese she-cat named Mayura. Jack helps her to hide from the humans pursuing her, and their adventures begin. They have several adventures, but the common thread is that Jack is the new King of the Cats and he suddenly has the human voice to prove it. He scares off (temporarily) dogs with it, and makes the mistake of showing off his new power to humans. Ebon, Alexander, and Cecelia arrive to take him to his coronation, but Alexander feels that, human voice or not, Jack is a common boor who does not deserve to be King of the Cats. Several others agree with him. Crazed Elihu Fox is waiting, unsure whether to enslave him for his value as a raree show, or kill him in case he is a demonic goblin. Jack is horrified when the seeress Cecelia predicts that he will face terrible difficulties; he will suffer terror and pain; and he will end his life in exile. The King of the Cats is being promoted both as a children’s novel and as a book for cat-lovers. Certainly, but Furry fans are sure to enjoy it as well. The vocabulary is adult; there are talking animals besides the cats; the personalities are distinct, and several show character development. This book does not have an age rating, but I would say that it is a good read for 12 up, definitely including adults. And it has a very attractive cover by Moa Wallin. Interesting - I certainly encountered the original (oddly creepy) story in books of fairytales when I was small. My elementary library had a collection of short story collections edited (well, probably not actually edited, but at least introduced and possibly selected) by Alfred Hitchcock; I was introduced to Daphne du Maurier's "The Birds," Robert Bloch's "Yours Truly, Jack the Ripper" and Richard Connell's "The Most Dangerous Game" in grade school via the Spellbinders in Suspense (I recently came across a collection associated with Hitchcock called Alfred Hitchcock Presents Stories They Wouldn't Let Me Do On TV, which is the best title ever). I respected the man's literary taste; he always seemed so smart in those "Three Investigators" books, after all. This probably explains a lot about me. One collection he did (Alfred Hitchcock Presents Something Something MONSTERS!, so it was my first pick, of course) featured a short story entitled "The King of the Cats" (I cannot remember the author's name) wherein the new King Tom is actually disguised as a human and totally macking on the narrator's would-be girlfriend; a friend who is into mythology and fairy tales advises him to tell the fairy tale of "The King of the Cats" around this strangely catty gentleman, and, well, I've already spoiled the ending, haven't I? It was my introduction to the fairy tale; whenever I read the old version, I feel like the story is only half right. No, dude, it wasn't the cat; it was this really cat-like dude who shouted, "Then I am the king of the cats!" Because of the "you're telling it wrong" feeling, the story feels more like an urban legend than a fairy tale to me. I remember that at least one of those "Stories They Wouldn't Let Me Do On TV" appeared on his program soon after the anthology came out. They ruined the story by the sappy new ending they gave it to get it onto TV. Of course, the real irony is today, most of them would be not only completely fine, but also tame to do on television (though a few, he admitted, were more about lack of special effects, which also wouldn't be much of a problem anymore); I think the only one that wouldn't work even today would be the Ray Bradbury one, "The Halloween Game" (or something; I'd describe it, but it works on a twist).